TYCHE, a product of AIBrain. Named after the Greek goddess of fortune, Tyche (pronounced “Tai-kee”) is an AI robot companion for kids. It brings good fortune to the family by creating an atmosphere that promotes learning, socializing, and playing, and enhances the imagination and creativity in young minds. 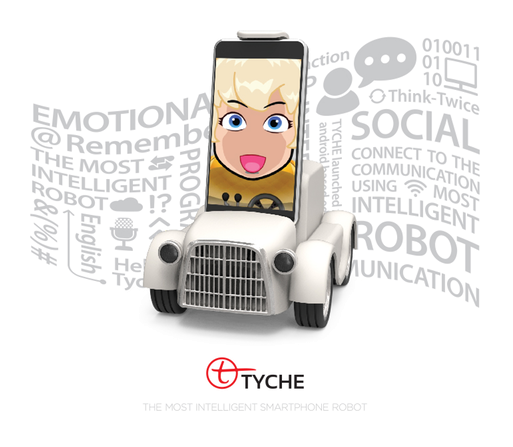 Tyche is an AI robot that talks, listens, thinks and reasons to plan and solve tasks. A total of 5 Android applications are available for download from Google Play. Several cutting-edge technologies have been built and integrated to bring Tyche to life. Interested developers can also innovate and add to Tyche’s capabilities. Tyche is uniquely designed to function intelligently by combining the power of your smartphone with the sleekly designed body. Tyche fuses natural language processing, memory, planning, and reasoning to converse with you. It can recognize your emotions and express its own. Tyche remembers multiple users and responds to them appropriately. In addition to enjoying the engaging audio-visual applications, you can also jumpstart your programming skills with a simple touch screen interface through the Build Your Own Intelligence (BYOI) app. The applications Talking Tyche, Acting Tyche, Tyche in the visual world, and BYOI, available for download in the Google Play, will open the doors for you to explore the world of Tyche.